THE DIRTY ARMY: Nik, Christian Trott– this guy has slept with just about all of Ontario. Being a Brantford and St Catharines native, he did what he could out there and now is attacking Toronto. What makes this one special is that he will get into your pants with his charm, but once he does, be careful. This loser carries DRD and tells everyone he doesn’t have it. Don’t believe me? Sleep with him long enough and you’ll get it. 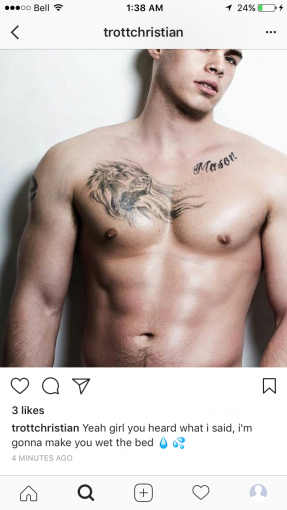 He’s also got the name “Mason” tattooed across his chest. That would be his son that he claims isn’t. His baby momma is famous for messaging and telling everyone otherwise, of course. Finally, to top it all off, of course he’s a gay stripper on Church Street. Well, quite the catch isn’t he?